Last month, we reported that the Alamo Drafthouse would be spending this summer honoring the summer of 1982 by holding screenings of Conan the Barbarian, The Road Warrior, Rocky III, Poltergeist, Star Trek II: The Wrath of Khan, E.T. : The Extra-Terrestrial, The Thing, and TRON, with all the movies being presented in 35mm. Tomorrow, a limited number of badges—priced at $80—will go on sale here at 11am CST and provide admission to all these movies. The Drafthouse will also be selling tickets to the first movie in the series, Conan the Barbarian, which will play on May 11th. In addition to the terrific movies that have already been announced, the Drafthouse has added 11 more movies to the summer series: Vice Squad, Escape 2000, The Sword and the Sorcerer, The Secret of Nimh, Pink Floyd: The Wall, Class of 1984, Friday the 13th: Part 3 in 3D, Halloween 3, Q: The Winged Serpent, The Dark Crystal, Fast Times at Ridgemont High, and The Last Unicorn. The badges won’t cover these movies, so you’ll have to buy tickets. Hit the jump for the full press release, which includes info on when you can buy tickets for each movie (and you better come to Rocky III since we’re co-hosting it!). We’ve also included a look at Dan McCarthy’s gorgeous E.T. 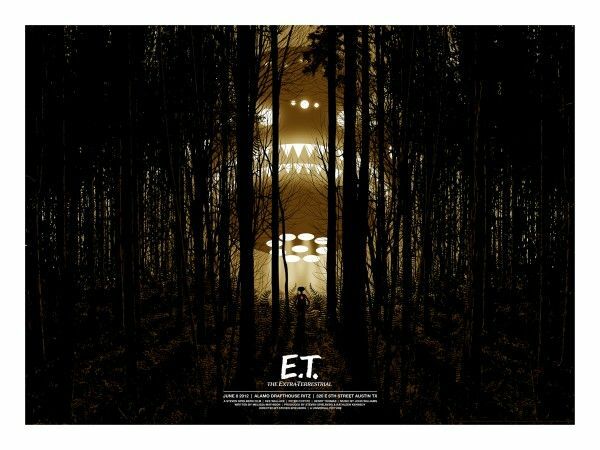 posters, which will be sold at the E.T. screening with any leftovers being sold online). Tickets Go On Sale Tuesday, April 17 For The 30th Anniversary Celebration Of The Greatest Summer Of Movies… Ever! Austin, TX— April 16, 2012— Alamo Drafthouse is recreating the “Summer of 1982” to celebrate the 30th anniversary of the greatest summer of movies… ever! From May through July, the theater will replicate 1982’s earth-shaking release schedule, screening eight of the biggest genre classics on the same weekends they were released exactly 30 years ago. These gargantuas include CONAN THE BARBARIAN, THE ROAD WARRIOR, ROCKY III, POLTERGEIST, STARTREK II: THE WRATH OF KHAN, E.T., THE THING and TRON, all presented in 35mm(unfortunately, Alamo Drafthouse was not granted permission to screen the sci-fi opus BLADE RUNNER). The unprecedented super-tornado of Hollywood magic in 1982 did not stop with those films, however, and the Alamo Drafthouse is expanding the lineup to include additional gems from that year, including CLASS OF 1984, THE DARK CRYSTAL, FAST TIMES AT RIDGEMONT HIGH, THE SECRET OF NIMH, VICE SQUAD, PINK FLOYD: THE WALL and more. A limited number of badges will go on sale Tuesday, April 17 at 11am CST at drafthouse.com/1982, “Summer of 1982” Badges will provide admission to the original 8 films in the programming series (note: badges do not include admission to the additional 11 titles announced and include Austin screenings only). The badges will cost $80. Tomorrow, tickets will also go on sale for the first screening in the series, CONAN THE BARBARIAN. 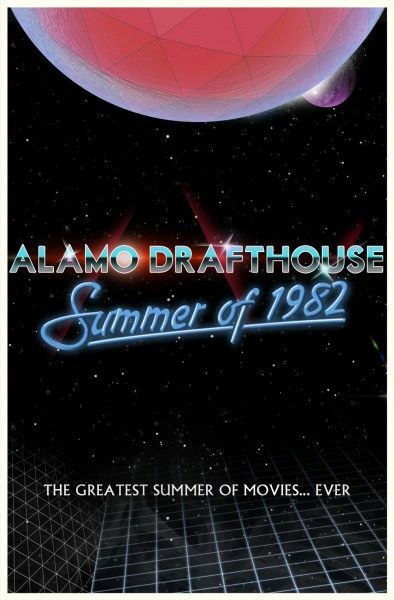 Visit local drafthouse.com theater sites for info on tickets to “Summer of 1982” shows for Houston, San Antonio & Winchester, VA as screening & ticket sale dates will vary. All subsequent “Summer of 1982” shows will go on sale two weeks before their premiere date. Visit http://drafthouse.com/1982 to purchase individual screening tickets & badges. Check local listings as some of these titles will not be available in at Houston, San Antonio and Winchester, VA locations.